Gillian from Newbiggin by the Sea was the first to do it 100 times. In fact, she spends about �0 a week doing it. Many of her friends in this tiny Northumbrian village now do it as well. Judy and the Bump are also regulars - Judy is at home waiting for her baby, aka the Bump - and Tina of Trowbridge sent in a special game card so that everyone else could do it in the pattern of a giraffe. The "it" is TV bingo, and it has arrived in millions of digital-TV homes across Britain. They are tuning in to a TV channel called Avago, which offers bingo-hall regulars a way to play cards without moving from their sofas. These new armchair gamblers are winning over �0,000 a month playing interactive TV (i-TV) bingo using their remote control in the privacy of their lounge. Avago's bevy of young, chatty presenters talk enthusiastically on screen as thousands of viewers punch their TV remotes to place their 25p bets. Using technology that allows the studio presenters to see how each viewer's bingo card is filling up, Avago has created its own gambling community of Gillians, Judys and Tinas. All are liable to get a mention as the live gambling unfolds. It's a simple formula and it might be the breakthrough that interactive TV gambling has been waiting for. But Gillian's obsession and Avago's success are testing the government's antiquated gaming laws to the limits of what is allowed today and what should be allowed in the future. The Department of Culture, Media and Sport (DCMS) is expected to issue a position paper in April that will outline just what the government's expectations are for the new legislation, with the intention of having a draft law ready for the next Parliament this autumn. The exact content is still under debate, but the government has made it clear that it favours adopting strong licensing and oversight rules rather than trying to bar gambling from new-media delivery platforms such as the internet and interactive television. This attitude has made the UK stand out as a promoter of "free-trade gambling" at a time when most other big western countries, including the US, advocate restricting online gambling in homes in order to protect minors and those who might become gambling addicts. But after watching bookmakers such as Victor Chandler move their online gambling operations offshore several years ago to avoid betting tax, the UK government seems eager to embrace these new-media forms of gambling (and their tax receipts) as long as punters are protected from larcenous operators and the business is kept free from criminality. If ever there was a case of technology outpacing the rules, i-TV gambling is it. In addition to Avago, there are nearly two dozen betting or gambling services available to Sky's 7 million digital TV customers that face little or no regulation. The services range from standard bookmaking from the likes of Ladbrokes and Littlewoods to entire channels, such as Red Button Racing, Gobarkingmad, the dog-racing channel, and Attheraces (part-owned by Channel 4) for horse-racing enthusiasts. And other companies plan to join in soon. Fancy a Flutter, a new channel backed by the leisure company Rank and interactive TV developer NDS, is waiting to pass muster with Sky's technical team before its launch. Flextech, the programming arm of cable company Telewest, is developing a casino-style gameshow, and foreign gambling companies, such as MGM Mirage and Sun City, are looking at opening i-TV operations in the UK. Sky is also planning more new services. There are significant amounts of money to play for. The UK is set to lead Europe in interactive gambling revenues: according to researchers Schema, we will take over half of the forecast $15.4bn in total European interactive gambling turnover by 2005. In the UK revenues from internet gambling will reach $6.4bn by 2005, while i-TV gambling will bring in $1.7bn. At a time when many niche TV channels are struggling to make ends meet, Avago made an operating profit only two months after going on air last July. It now boasts 70,000 registered users and in February was estimating an annual revenue of �m. Players pay 25p for each virtual bingo card that they download into their TV set-top boxes, and Avago also keeps a share of the call revenue levied while they are playing. Neil MacDonald, CEO of the Digital Interactive Television Group (DITG), which created Avago, says that the channel is a kind of Andy Warhol TV, where ordinary people get their 15 minutes of fame. "The presenters chat about the players and they come back again and again." In fact, some 20% of Avago's registered players, such as Gillian from Newbiggin by the Sea, play so often that the presenters talk to them by name. "It's good telly," says MacDonald. "It's entertaining and you can win." Sky's own i-TV gambling offerings centre around betting on football matches, but new services are coming and Sky's most recent financial results showed just how important TV gambling using the remote control can be to the bottom line - the profit margin from betting was up significantly. Sky has deliberately moved away from low-profit telephone betting to bets made using the remote. The effect has been to replace sophisticated gamblers who bet larger amounts with more "amateur" punters who lose smaller amounts far more often. i-TV-based betting is much more of a mass medium, and for Sky the margins are much better. "We want a volume of customers who enjoy their betting and are open to new ways of betting," says Nick Rust, the managing director of Sky Bet, Sky's licensed bookmaker. 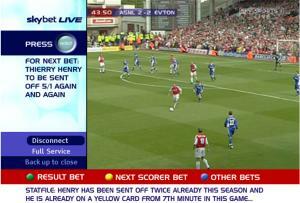 Since its launch in December, the Sky Bet Live! service, which integrates betting with Premier League games using two clicks of the red remote control button, has performed well, with "hundreds more bets per game", says Rust. Red-button betting on Nationwide football games was recently added, and other sports will follow. Sky is also looking at adding "contextual betting" to other types of broadcast content, from politics to entertainment, over the next few months. Simple games like Ballseye, a numbers game which is reputed to have brought in � last year, are being updated using the latest browser technology to make it more attractive to a wider audience. Full-broadcast games channels like Avago are also said to be a priority for Sky's new programming head Dawn Airey, and the first of these could launch as early as this autumn, depending on how the new legislation shapes up. "Historically, gambling has been an adult product concentrated around adult premises that are regulated by the Gaming Board. But all of a sudden technology has brought it into the home, so proper licensing and regulation is needed," says a DCMS spokesman. The government says it wants to ensure that operators are reputable, that they provide a fair service, and that proper screening and warnings about the addictive qualities of gambling are included. But the big unanswered questions for the new-media operators of gaming are these: what kinds of betting will be allowed, what constitutes a highly addictive game, and how will the new services be taxed? "There are a lot of grey areas that need to be cleared up," says DITG's MacDonald. Avago is already pushing the regulatory envelope. Current legislation restricts casino-style games and bingo to licensed premises. So although it looks and feels like bingo, Avago calls it a "best-numbers game" and points out that it has "fixed odds" that are known to players. The game is never referred to as "bingo". MacDonald argues that because Avago is a "fixed-odds, best-numbers game", it is not traditional bingo, and so far this strategy has kept the channel under the regulatory radar of the Gaming Board, which regulates gambling premises. Making viewers click their remote controls twice to reach Avago's inter active service, where real money can be wagered, gets round the independent television commission's rule that betting is not allowed on an actual TV broadcast. The ITC established the "two-clicks rule" as a means of differentiating the broadcast from the interactive or internet element, which it does not regulate. "The important thing is that viewers know where they are," says an ITC spokesman. "Two clicks means that the viewers have actively sought this service out." A roulette-style game launched by Avago's creators in December has not yet attracted any calls from the Gaming Board. Avago plans a similar strategy for a new dice game, which should launch within the month. For its roulette game, the colours of the table have been changed and the casino "craps" game will use three dice instead of two. Observers say that these games may be too thinly veiled to survive for long. "These kind of artificial devices to save the conscience of the regulator are not going to wash over the long term," observed one DCMS insider. Interestingly, Sky is displaying caution in introducing its own new betting services. Cynics say that this is because it was caught on the back foot when it failed to develop some of the necessary technology pioneered by DITG. Sky says it has pioneered interactive services on its platform. "We have taken a lot of legal advice about what is and is not acceptable," says Nick Rust. "At the moment we are launching games that are clearly permitted under the current laws." The laws regulating gambling in the UK need a revamp. Most date from the 1960s and so do not take into account the new technologies. It was only in 2001 that an independent review body published the Budd report, which addressed the issue of online gambling for the first time. Now the government seems particularly keen to establish codes of practice to ensure socially responsible gambling, to protect children and the vulnerable, and to make sure that gambling is fair and above board. For consumers, the first inkling of the anticipated changes may well come in the ad breaks. Currently, the National Lottery is the only gambling game that has permission to be advertised on TV. But can we expect the new legislation to allow the likes of Avago to join in? Don't bet against it.